A veteran coach in the world of Gymnastics, Tumbling and Cheerleading, CoachWayne has taught private lessons, camps and clinics in both the United States and Europe. Among his accolades, Coach Wayne has produced eight instructional videos; the top-selling 7-video set "Better Back Handsprings" and "Basic Handstand Position." 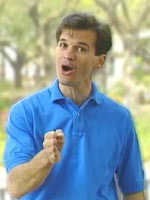 His "Tumbling Tips" articles are read by hundreds of thousands of students and teachers worldwide. He was Executive Coach of Olympic Gymnast, Zuzana Sekerova and Master Coach for numerous cheerleading and gymnastics instructors. Having performed as a gymnast, dancer and cheerleader since the age of 11, CoachWayne continues to share his experience with new generations of students. Visiting Coach, Consulting Coach, Staff Coach, Senior Managing Coach to private gymnastics clubs 1984-1994. "How to Do a Better Back-Handspring" Seven Video Set. VHS/DVD ©1991. "The Way of Champions", Youth Sport-Motivation audio tape ©1991. "The Basic Handstand Position" Video. VHS ©2001. List of others can be found in LINKS section. How to Turn your Hands the Right Way in your Back-Handspring, ©2003. Founder - ~CoachWayne! (R) Gymnastics, LLC/ ~CoachWayne! Gymnastics Franchising, LLC, 2007 - current. Recreational Gymnastics Schools. Publisher - www.CoachWayne.com - World Wide source of advice for tumbling throughout online cheerleading & gymnastic communities. Over 250 daily visitors. Executive Coach of Zuzana Sekerova, Olympic Gymnast. 2003 - 2007. Mrs. Sekerova has had a lifetime of achievement in artistic gymnastics. She was the only member of the Slovakian Team to compete in Women's Artistic Gymnastics at the Olympic Games in Sydney, Australia, 2000. In her second Olympic Games Zuzana ranked 47th this past summer in Athens, Greece. Zu also competed at the World Cup in La Serena, Chile in 2004 and American Cup 2005 in New York. In Chile Zu won the GOLD MEDAL on balance beam.